Please RSVP by August 5th. Please note the change in venue. We hope to see you there! Greetings! We would like to invite all our friends and family to the 3rd annual Word Down Syndrome Day at McKey Park. The event is set for Saturday, March 16, 2013 from 12 noon-4 p.m. Worldwide, this is the 8th year that World Down Syndrome day has been observed. The date of 3-21 was set since individuals born with Down Syndrome have 3 copies of the 21st chromosome. We will have our traditonal yellow and blue balloon release, a bounce house and slide for the kids, and lunch. We are asking for families to assist with food items or other donations for the luncheon. If you would be willing to help, please let me know, and I will e-mail out a list of items for you to choose from. If you have any ideas you want to share for that day, please let us know. We cannot do this without your support. Let's get out and celebrate those who are living with Down Syndrome! Greetings everyone and Happy New Year. As we push forward into another year, we are coming up to our 2nd anniversary since we decided to form our group. We have many wonderful ideas that we would love to expand upon outside of the talking and planning stage; some of which include things such as fundraisers for our group (including a Buddy Walk), educational opportunities at resource fairs and community events, and a library with material devoted to Down syndrome and other informative resources to our members and new parents. If you feel led to head up a project or you have an idea you want to share, please let us know. We are here to assist you and your family. Speaking of ideas, we do have two socials planned in Feb. and March. Our January meeting is scheduled for this Saturday, January 12th at First Christian Church on Patterson Street, Valdosta, Ga. First Christian has generously supported and allowed us usage of their church to hold these meetings every month. The meeting site will not change unless you are notified from us ahead of time. Big thanks to First Christian for allowing us to be on site. We are still working on childcare for each meeting. If you have any suggestions on childcare possibilities, please let us know. Please make plans to join us in Feb for a Valentine social at our regularly scheduled meeting time on 2/9/13. 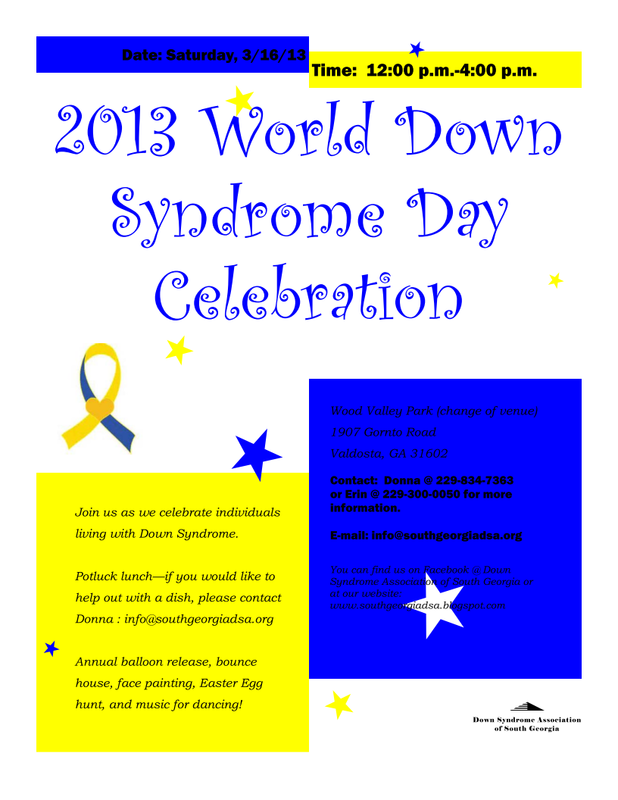 We will also have our 3rd annual World Down Syndrome Day celebration at McKey Park on Saturday, March 16th. 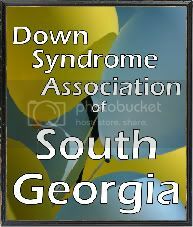 World Down syndrome day is actually on 3/21 (3 copies of that extra special 21st chromosome--that is why this day was chosen), but we have already planned for the next several years to hold it on the 3rd Saturday in March. Everyone can mark their calendars way ahead of time! We hope to see you soon! If we can be of any service, please do not hesitate to contact us at info@southgeorgiadsa.org. The November meeting scheduled for Saturday November 10th has been CANCELED! Activities will resume in December. Make sure to check back here to stay updated on times. Just a reminder that we are still meeting monthly as a support group on the second Saturday of every month during the school year. We meet at First Christian Church, 1905 N Patterson Street, Valdosta, GA 31602. Our meeting time is from 10 am -12 noon. Next meeting is this Saturday, October 13th, 2012. We would love to see you there!